Gordon Matthew takes on the RideLondon-Surrey 100 Bike Challenge! Local IT Turnaround guru, Gordon Matthew, will be taking part in the very first Prudential RideLondon-Surrey 100 Bike challenge. The event will take place on Sunday 4th August and it promises to be one of the biggest and best celebrations of cycling the UK has ever seen. It is a unique festival of cycling and will bring together more than 90,000 cyclists from around the globe. When Gordon is not developing Business plans or participating in Board meetings, he heads for the great outdoors….on a pedal bike! He is a keen cyclist and most weekends he teams up with a fellow Glaswegian to cycle an average of 35 miles even in the winter! 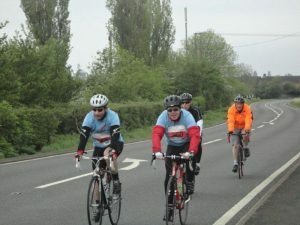 Gordon was awarded a place in the RideLondon-Surrey 100 and wants to put his pedal power to good use and raise money for Shipston Home Nursing. Keep his pedals turning, dig deep into your pockets and support him to complete the 100 mile timed event from Queen Elizabeth Olympic Park, through 10 London Boroughs and the hills of Surrey, finally reaching the home stretch along The Mall.